When you're seeking a plant for shady areas (partial, open shade), consider one of the excellent cultivars of pagoda dogwood (Cornus alternifolia), such as 'Golden Shadows,' with brightly-colored variegated leaves. The plants common name derives from the tiered, pagoda-like shape of the growth habit, and the Latin species name derives from the alternate position of the leaves on the stems. This large shrub/ medium tree grows to 15 to 25 feet and produces yellowish-white flowers in flattened clumps in late spring. Bluish-black berries follow the flowers to provide winter interest. 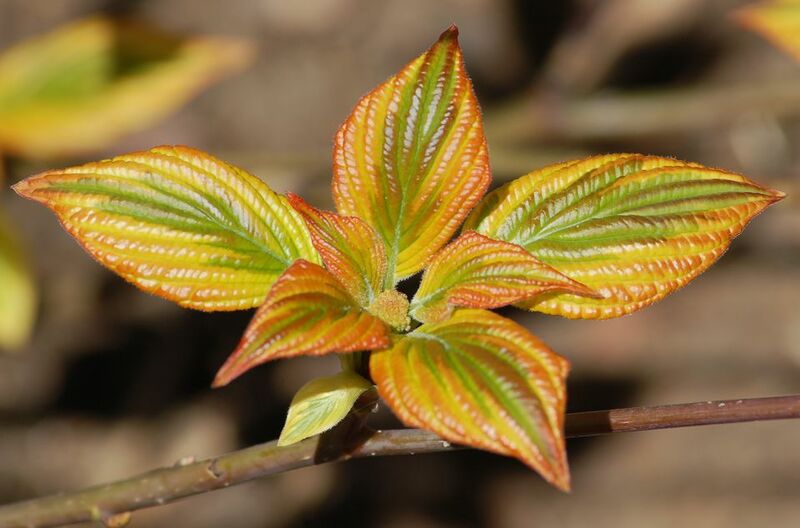 Both new leaves and fall foliage tend to take on reddish-purple, reddish-orange, or coppery coloration that is quite different from the color the plant has for the rest of the growing season. 'Golden Shadows' or another cultivar of pagoda dogwood can make an excellent specimen plant for a woodland garden. For best performance, plant pagoda dogwood in moderately moist but well-drained loam that has an acidic soil pH. The plant will also tolerate clay soil, but will grow more slowly. This species is an understory tree in its native range, so dappled shade is its preference. Pagoda dogwood comes with few maintenance burdens. Work compost into its soil to fertilize. This will also help the soil retain water, as will an application of mulch. Pruning is optional, but if you do prune (some people may wish to trim a little here and a little there to modify the shape slightly), do your pruning in late winter. Pagoda dogwood generally prefers dappled shade conditions that mimic the understory conditions under large trees. In warmer regions, it appreciates more shade; in colder regions, more sun may be preferable. This tree likes loamy soil that is relatively moist but well drained. It prefers an acidic pH. Pagoda dogwood should be watered weekly when there is no rain; it requires about 1 inch of soil per week. This plant likes moderately cool summer temperature and humidity levels. In hot climates, you may need to provide shade and make sure the soil is mulched to keep it cool. Pagoda dogwood does not require feeding; mulching over the root zone provides sufficient nutrients. Or, compost can be worked into top few inches of soil beneath the tree each spring. Cornus alternifolia 'Golden Shadows' has green and gold variegated leaves and grows 10 to 12 feet tall with a similar spread. C. alternifolia 'Argentea' is known as silver pagoda dogwood. It is also variegated, but with white leaf margins that give a silvery effect. It grows 12 to 15 feet wide with a spread of 10 to 20 feet. Cornus controversa, the giant pagoda dogwood is so named because it boasts a mature height of 60 feet. This plant is native to eastern Asia. Like other dogwood species, pagoda dogwood is best propagated by taking stem cuttings and rooting them. Cut a 6-inch length of stem from the tip of a branch. Make sure there are 4 to 6 leaves. Pinch off the bottom pair of leaves from the stem, leaving wounds in the stem. Fill a small pot with rooting medium—either a commercial mixture or a make-your-own mixture of sand and perlite. Moisten the rooting medium with water. Dip the bottom 1 1/2 inch of the stem into rooting hormone. Bury the bottom of the cutting 1 1/2 inch deep in the rooting medium, and pack the medium tightly around the stem. Place the cutting and pot inside a large plastic bag and seal, making sure the leaves don't touch the bag. Check the cutting once a week to see if it has developed roots. Either look at the bottom of the pot to see if roots are coming through, or give the stem a gentle tug to see if it is anchored. Remove the plastic bag once roots have developed, and place the pot in a sunny window and keep it moist. Fertilize every 2 weeks with diluted liquid fertilizer until the plant is growing well. When the cutting outgrows its pot, move it into a larger pot filled with regular potting soil. Well-established new plants can be transferred to the landscape in fall. Dogwoods are prone to leaf spot, twig and leaf blights, root rot and canker. Occasional insect pests include scale, leaf miner, and borers. Dogwoods are most susceptible to insect infestation when the lower trunks get wounded by lawnmowers or weed trimmers, so take care to avoid damaging the bark. According to the USDA Forest Service, various types of birds eat the berries of pagoda dogwood (including the ruffed grouse), as does the black bear. This appeal to wildlife also extends to deer and rabbits, which can badly damage the bark and branches of dogwood. Young trees are especially susceptible and may need to be protected with fences if rabbits or deer are a problem.